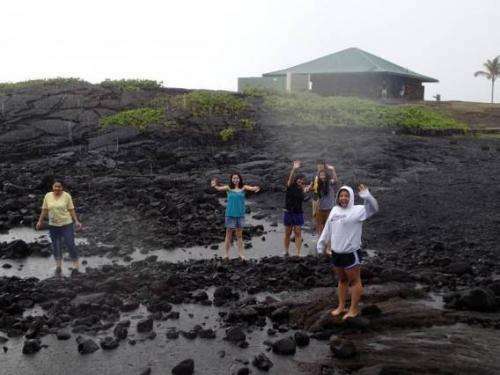 Since 1983, the 180,000 residents of the Big Island of Hawaii have lived in the wake of the pollution caused by the active shield volcano Kilauea. The destructive nature of the volcanic smog ("vog") has imprinted a significant ecological footprint on the surrounding infrastructure, vegetation, and human health. With the volcano's eruption now in its 33rd year, research from the Department of Civil and Environmental Engineering (CEE) provides an improved understanding of the atmospheric pollutant mix that island residents are exposed to on a daily basis. In particular, a new study uncovers two fundamental features of Kilauea's volcanic plume: a strong dependence of sulfur partitioning on meteorology and time of day, and the presence of particles that are exceedingly high in acidity. The findings were published March 18 in the journal Environmental Science and Technology, and were carried out by 28 CEE undergraduate students; lead authors Jesse Kroll, associate professor in CEE, and CEE research scientist Eben Cross; and nine other MIT researchers and collaborators. The study was conducted in coordination with CEE's Traveling Research Environmental eXperience (TREX) in 2012 and 2013, a program that is offered to Course 1 undergraduates during the Independent Activities Period and which involves an annual trip to carry out environmental fieldwork. "As a sophomore, TREX was an excellent chance for me to develop my research skills so I could apply them to other projects in the future," says Theresa Oehmke, now a fourth-year Course 1 undergraduate. "It is a program that not many other universities offer." The support system she gained in CEE and the opportunity to participate in published research were two invaluable benefits earned from the program, she adds. According to Sidhant Pai '14, a Course 1 undergraduate participant in the 2013 trip, TREX was one of the "most enjoyable and memorable MIT experiences" and "really got [him] excited about environmental science." After TREX, Pai continued to study Kilauea with Kroll and Cross as part of the Course 1 Undergraduate Research Opportunities Program (UROP). "Given that millions of people live close to volcanoes globally, it is important to understand plume chemistry before we can characterize the impact that the emissions have on human health and the environment," Pai says. "The work done by TREX is an important step in that direction." The team's unique approach to studying the sulfur emissions allowed them to better understand the intensity of the vog and the acidity of the particles. During their time on the island, the CEE team spoke with a wide range of residents regarding the volcano's influence on the locals' daily lives. One Pahala rancher, Lani Petrie, recently had to replace her fences for the second time, attributing her property's rotted infrastructure to the volcanic emissions. Originally constructed from steel, Petrie's fences corroded when Kilauea's vent opened in 2008 and spewed higher amounts of sulfuric acid into the air. She then attempted to replace the material with stainless steel, only to result in similar deterioration. Petrie is now testing fences constructed from fiberglass—a resilient, but more expensive material. "The whole island is impacted from the volcano, and we're just exposed to it constantly—Pahala especially," says Lisa Wallace, a chemist from the Hawaii State Department of Health. "Residents, mostly downwind, complain of respiratory complications, eye, and throat irritation. A couple of my coworkers even experience chronic bronchitis that just will not go away, and this isn't unheard of." Wallace herself experienced the firsthand effects of the vog, when the roof on her home completely corroded after only five years. To have similar, in-depth studies such as this conducted on the chemical nature of Kilauea, she said, would "certainly help to improve the way construction processes, construction materials and even plumbing are handled" on the island. "The majority of the data was collected by the students in 2013," says Kroll. "The 2012 group, however, set the precedent for how to collect the data. They gave us all of the information we needed on how to make the 2013 TREX mission work." 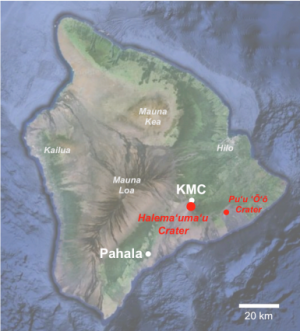 In 2013, the students carried out real-time measurements of the key chemical components from Kilauea's volcanic plume, and produced a detailed characterization of sulfur partitioning with unprecedented time resolution. "Sulfur dioxide (SO2) oxidizes in the air to form sulfuric acid particles, and these can then neutralize to create ammonium sulfate," says Kroll. "Our intention with this project was to understand the extent and the rate at which these chemical processes happen and what the people are exposed to on the island: SO2 versus sulfuric acid versus more neutralized particles." 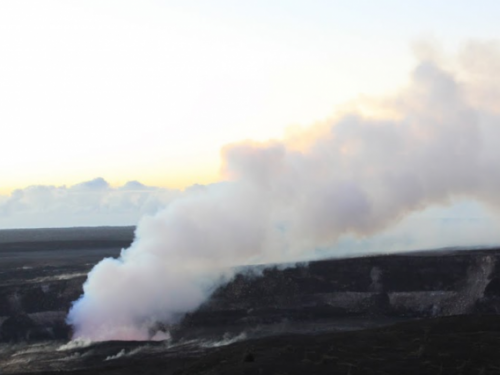 Over the course of the study, the students analyzed the emissions from the vent of Kilauea's crater at two different locations—seven days at Kilauea Military Camp located on the north rim of the crater and 12 days directly downwind of the vent in the town of Pahala. The team used a sulfur dioxide monitor and an aerosol chemical speciation monitor to measure the relative amounts of gas-phase SO2 and particulate sulfate every five minutes. "It's rare that you would see such a highly acidic aerosol plume persisting over space and time," he says. "In most environments, there's going to be a sufficient amount of ammonia present in the gas phase, both from natural and anthropogenic sources. This would normally turn that sulfate from sulfuric acid to more neutralized forms." However, the team found that the amount of sulfuric acid was much too high to be neutralized by the available ammonia, giving it an acidity level lower than that of battery acid. SO2 is highly toxic to both humans and plants; since it is emitted directly from the volcano, it is known as a "primary pollutant." In the atmosphere, SO2 will oxidize to form sulfuric acid (H2SO4), a "secondary pollutant," that can contribute to harmful particulate matter and acid deposition. As secondary pollutants are formed by chemistry and not simple emissions, they can be exceedingly problematic to isolate. In this case, the TREX team knew that the vast majority of the measured SO2 and H2SO4 came from the volcano, allowing them to monitor out the conversion of one pollutant to the other. Today, the team's goal is to employ measurements from this study in upcoming TREX expeditions to the Big Island. "The next important step in this exploration is to make robust measurements with lower-cost equipment," says Cross. This objective drove the most recent TREX expedition, during which the students increased the instruments used at the Pahala site and built and deployed homemade SO2 sensors in various locations. "In 2013, we got a clear snapshot of one place," Kroll says. "We need to perform this experiment all around the island and attempt to truly understand where the SO2 is going and how fast its chemistry is occurring." Future findings will lend themselves to the development and implementation of solutions for the island's infrastructural challenges. Course 1's TREX subject for undergraduates will continue its exploration of the influence of Kilauea's plume on the environment, enabling communities to understand the vog's ongoing impact on local air quality and ecological health. "Since TREX, I have gotten more exposure to the field and intend to eventually apply to grad school to pursue it further," says Pai. "To be credited in the publication alongside my instructors is an honor, and I'm really glad I could be a part of the process."